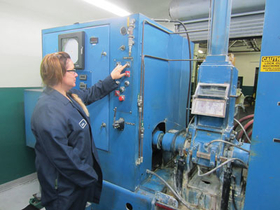 Nicki Hershberger, technical consultant at Polymerics Inc., checks a mixer at the firm's facility in Cuyahoga Falls, Ohio. 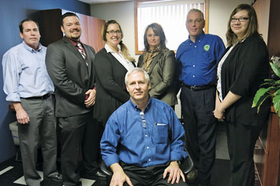 CUYAHOGA FALLS, Ohio—Change is just more than idle talk these days at Polymerics Inc. Visitors not only can see proof of it inside the building of the custom rubber mixer, from the new, energy-efficient lighting to renovated offices, to the firm's new F80 mixer, as it works on its color line and increases cooling capabilities on its black line. And perhaps, most notably, they can see it in the body language and hear it in the voices of the Polymerics management staff. "It's an exciting time for us," said Technical Sales Manager Santino DeSimone. "It's a great place to work." "You enjoy walking into these doors each day," said Troy Smith, a 30-year employee and plant manager of the 56,000-sq.-ft. Cuyahoga Falls facility. "The big difference is morale," said William Sanderson, a 24-year company veteran who is environmental, health and safety manager. "Morale is so much better, ever since Tim came back full time, working day to day." "Tim" is CEO Tim Samples, whose family founded the firm in 1972. Samples worked at the plant from the mid-1970s to the early 1980s. He returned for his latest stint in 2011, assuming day-to-day operations of both Polymerics' facilities—the headquarters in Cuyahoga Falls and the other in Kent, Ohio, where chemical blending is conducted—in 2012. The facilities have a combined work force of around 80. The firm also has another facility in China, two hours south of Shanghai. Polymerics is in the process of investing $1.5 million in upgrades at the firm's Cuyahoga Falls and Kent plants. A third of that money was spent on improvements in 2013. "(Samples) knows all the nuts and bolts of the business because he was working on the shop floor before he was in the position he is today," Smith said. Samples has noticed the impact that the changes have made. "I wasn't gray then," he said with a laugh. "The company had been run a certain way for a long time," he said. "It's not changing that fast, but it's changing, and it's starting to snowball." • Renovated front office and receptions areas. In addition, the company is testing different types of pelletization systems. Its goal is to install a new system by 2015. All of the improvements are part of Polymerics' master plan: Improve product quality, expand the firm's customer base and become a key player in the custom rubber compounding industry. The new company slogan—keeping service in the mix—reflects just that. "The rubber industry is small, and the word of mouth is just as important as all the other advertising you do, so that's why the big push is on quality," DeSimone said. "A lot more people are going to complain about bad product than are going to talk about that good product, so what we want to try to do is get people talking about a good product and the success they've had with us and the good experience hopefully they had working with us." And that in turn, could lead to more business. The company currently serves customers within a 300-mile radius of its headquarters, providing custom compounds using a wide variety of elastomers for sectors such as automotive, medical, hose, belts, automotive, military, medical, safety, seals and gaskets, rubber rollers and coated fabrics. "You think fast food, you think of McDonalds first. When people are thinking they need rubber quoted, we want them to have Polymerics on their mind for a quote," DeSimone said. Employees say that the company's small but focused structure sets it apart. With a lean operation, Polymerics can turn products around faster than some of its larger competitors, according to Smith. "We're nimble enough that if there's a problem or an issue, customers can talk to me directly," he said. "I can walk out on the floor and help correct the problem easily. The customer isn't telling a subordinate who is telling his subordinate about that problem." "Most everyone here can influence a decision one way or the other," DeSimone said. "Tim is really good about working through issues because whatever it is, internally or externally, there's isn't all that bureaucracy, all that red tape to go through." A new pelletizing system should enhance the product. According to Smith, the product now is cut into small squares, the shape of Chicklets. "Essentially, we're looking at something that has good cooling, has higher throughput and will improve the appearance of the product that's going out," he said. "We want something that's a little more uniform." When that happens, DeSimone said the company will be able to go after business it hasn't sought before because "of the limitations on the machinery we now have." Those aren't the only changes Polymerics plans to initiate. 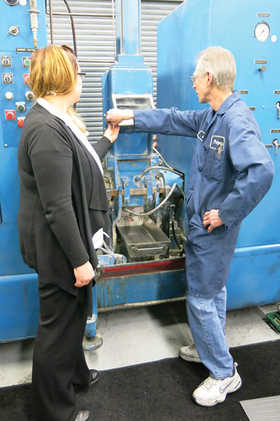 Nicki Hershberger and Mike Arnold of Polymerics check on a lab mixer. The company plans to move into another facility in about four years. Samples already has been scouting potential sites and doing his due diligence. The plan is to stay in northeast Ohio. "We're kind of landlocked here," Samples said. "We have to get a building so that we can expand." Samples said Polymerics wants to maintain 10 percent growth each year over the next five years. "We're hoping to get a form-filling machine for the Kent facility that will reduce their labor cost, and we're looking at improving our throughput here with the next mixers that we're getting," said Kimberly Marquis, operations manager at the 36,000-sq.-ft. Kent facility. "If we get the pelletization equipment that we want, it will open other markets and help us maintain that growth." The push to enhance the Polymerics name also includes more involvement in rubber-related activities, a drastic change from past practices. Polymerics will co-host the Intermediate to Advanced Compounding and Testing of Rubber training classes, along with Akron Rubber Development Laboratory Inc. and the Rubber Division. Classes will be offered April 8-10 at the Rubber Division facility in Akron. Those are all part of Polymerics' transformation. "Tim is trying to reinvent the way that we do things, the way that we perceive things," said Nicki Hershberger, a technical consultant with the firm. "It's a breath of fresh air for the company, to see life again."